When do people lose motivation for training? I wanted to find out. So I looked through my files for the last 2 years. 1. Most lose it right after a long vacation. 2. The second group lose it after some form of minor illness, injury, or accident. 3. The third group are the insomniacs. People who have troubled sleep, who are either too tired from not sleeping to work out, or overslept and don't work out. Along with them are people who have to miss training due to work or school. 4. In some tough financial situation that does not allow them to train. I saw a pattern emerge. 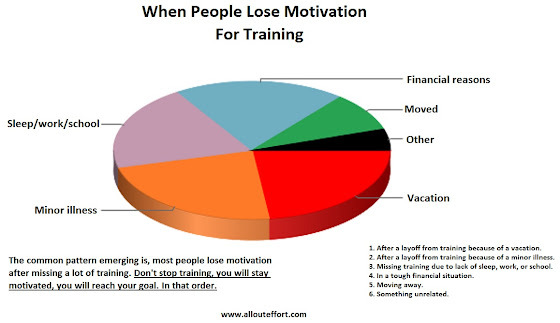 Almost 70% of people who lost their motivation, lost it after missing training for an extended period of time. I looked back on my days working at the health club, and my lifetime of martial arts. It holds true, the more training you miss, the harder it is to come back. It has something to do with routine, and not sticking to it, especially on vacation. I know guys in martial arts who have been training 10 years who average around 30 days of training a year. They keep stopping, and trying to restart. Now people who leave on business trips, even if they are extended business trips are immune to these statistics. Why? It goes back to routine. Work is part of their routine, and so these people tend to still work out while away on their business trips. Something about vacations, being sick, being an insomniac, you just want to turn everything off. You are not shut off on a business trip, in fact you have to be on. People who work out on vacation as well, never lose that motivation. Now you can be active, hike, swim, walk, bike, etc. But your mind still considers it part of the vacation experience. So it still feels out of the routine. Its the ones who still hit the gym, step out of the vacation stuff and back on their routines of working out who never lose the motivation. I tell our members, you can take a vacation from here, but you can't take a vacation from your goals. Now with people who never stop training, they stay motivated, and their statistics of reaching their goals are almost a foregone conclusion. Even if you take classes, go to the gym on your own, or take martial arts, it's hard to come back from a layoff and get back in there. We actually even compiled a list on how training frequency and diet affected out clients. There is this idea, that fitness is about creating a new you, and getting rid of the old you. This is a psychological fallacy and couldn't be further from the truth. Yes it is about old you vs future you, but old you is who we must root for, the new you is our enemy. Yes you read that right, the new you is our enemy. The old you, the one who first began training, who made it a priority, who came in and sat down with me for a consultation, that person is who we must stay true to. We must stay true to the resolve of the old you. Future you, will constantly try to sabotage you, get tempted, handicap you, lose motivation, get sick, go on vacation, have troubled sleep want to indulge in eating, hit hard financial times, be too busy, drink too much, stay up too late, have personal problems, etc. It's why most people have a lot of results their first month and either taper off or plateau or lose it. Because old you had the most motivation. We cannot forget about the old you, the one who had a reason for training. The one who said I'm sick of always being tired, I need to train to have more energy. Future you who couldn't sleep will forget why you started training and will tell you its not worth it. The one who said they want to always be productive, who train to give their life meaning. Future you will come back from a vacation and want to use all your time for leisure, and will not remember why you even started training, that its getting in the way of your leisure time. The one who wanted to start a new business, who wanted to prove they could stay committed, strong, determined. Future you may forget and need a reminder. The one who said you could. Future you will say you can't.